The Center for Media Justice | We just sued the FBI for hiding its surveillance of Black activists and organizations. 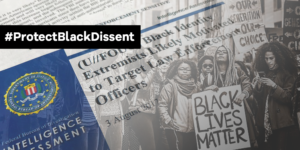 [Image Description] A group of Black Lives Matter activists are shown next to FBI documents labeling them “Black Identity Extremists.” Above that is the call to action: #ProtectBlackDissent. The FBI is using the invented label “Black Identity Extremists” to justify its ongoing surveillance of Black activists. They have refused to provide the information we requested to learn more about why this label exists and which Black people and organizations are being targeted as a result. So today we partnered with the ACLU to sue the FBI. But we can’t fight this in the courts alone. 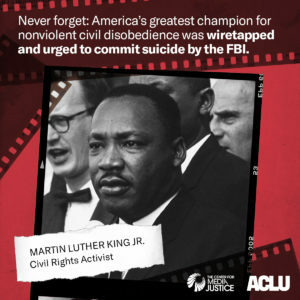 Sign the petition: The FBI must stop targeting Black activists for surveillance and investigation. Just as J. Edgar Hoover named the Black Power movement of the 1960s “the greatest threat to the internal security of our country,” the “Black Identity Extremist” designation is the latest attempt to justify the surveillance and criminalization of Black people fighting for social justice. Over 50 years after Hoover’s COINTELPRO, our right to protest and organize is still under attack. Last fall we filed a Freedom of Information Act (FOIA) to get more information about the FBI’s “Black Identity Extremist” designation, but they ignored our requests. So we’ve joined the ACLU’s Racial Justice Program today in filing a lawsuit demanding the release of all documents linked to this wrongful surveillance of Black activists and Black-led movements. We’re not backing down but we need your help to keep the pressure on. Add your name: Demand that the FBI stop targeting Black people and Black-led organizations based on the fake “Black Identity Extremist” label. Read Malkia Cyril’s take on today’s lawsuit.